In celebration of Cocopah’s 50th anniversary, spend $50 for tickets and you will receive 60 tickets and a coupon to receive a treat at the bake sale. Go to the Ticket Sales Table at Celebrate Cocopah to purchase. Questions? Please contact Toby Ownby. Please visit cocopahmiddleschool.24fundraiser.com to register and start bidding. Great items are available: spa days, sports tickets, restaurants, summer camps, travel… You can’t win if you don’t bid! Check back frequently as new items are being added. Cocopah 50th Anniversary Commemorative Bricks: Leave a legacy behind – buy Cocopah 50th Anniversary Commemorative Bricks! Click here to order online with a credit card. Click here to print the form and pay with a check. 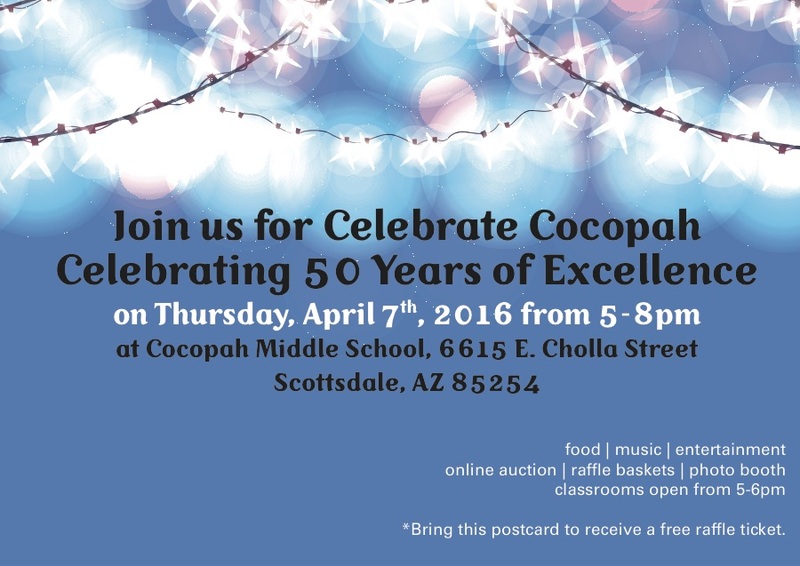 Celebrate Cocopah is great opportunity to get involved. There are many choices: volunteer a little time (ticket sales, lawn games, food sales, etc.) or donate needed items (drinks, baked goods, plates, etc.) Please check out the SignUp Genius for a list of ways you can help at the event. Lunchtime Volunteers Needed to Sell Raffle Tickets: Volunteers are needed to sell raffle tickets Monday-Thursday the week of Celebrate Cocopah. Please sign up here. Cocopah Book Fair: Start making your summer reading list and visit the Cocopah Book Fair on the cafeteria stage. All proceeds go to the library to make sure students have access to the latest thrillers! Classroom Basket Raffle: Thanks to all the families that have donated to the classroom baskets. The completed baskets are due on Monday and will be displayed for the students in the cafeteria starting April 4th. Some baskets include: gift cards galore, Scottsdale Quarter, art basket, outdoor games, Beats, iPad, Lululemon, Go Pro, Hoverboard, movie basket, money tree – branches filled with CASH! Please contact Amy Carney with your donations for the online auction. Please contact Tracey Hott with any questions or to volunteer at Celebrate Cocopah.